Emily's Recipes and Reviews | UK Food Blog | Leicestershire : happy easter cake + sugarcraft giveaway. Hope you're all enjoying the start of Spring and making and baking some Easter treats. If you haven't made anything yet, here's a little Easter cake to hopefully get you inspired! 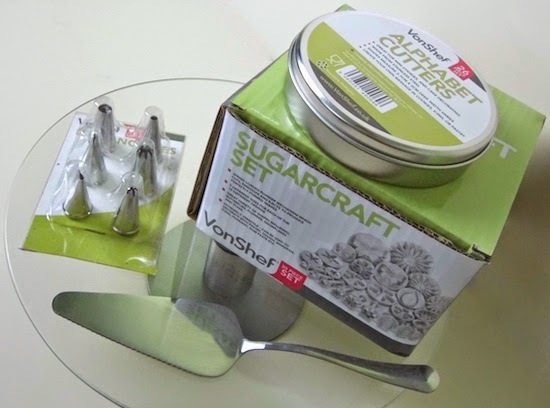 I've always wanted to work on some sugarpaste and cake decorating skills - so what better excuse than this lovely selection of sugarcraft tools from VonShef at Domu. Showcasing the alphabet cutters, piping nozzles, various stampers and a swizzling cake stand (technical term), at the bottom of this post they'll be a chance to win all the tools featured in the post. Exciting stuff! So firstly, it's important to say that I rarely do any cake decorating and its definitely not something I'm very good at. It's something I love the idea of though, as I find the likes of pasta making and macaron baking really therapeutic and rewarding. Only owning a few piping nozzles and a couple of cutters, I can honestly say these bits and bobs are the perfect way to start out as a beginner. I'm already planning my next cake! So I began by making a classic lemon sponge with the following recipe, although be my guest at all sorts of flavours and fillings! ♥ Green food colouring, I used Sugarflair Spruce Green and only coloured half for the topping. ♥ Food colouring of your choice - I love the Sugarflair colours! Tip; What I like to do is weigh the three eggs, then whatever their combined weight (for example 208g) I would use the same measurement for the other ingredients, so 208g sugar, 208g flour, 208g butter. Call me odd but it seems to work wonders! Equipment; Two 8'" cake tins or silicone moulds, ideally a mixer, rolling pin, wire rack and pretty plate. Step one. Mix together the ingredients until well combined. Step two. Grease your cake tins or moulds and distribute the mix evenly between the two. I use scales here just to be sure. Step three. Bake for 20-30 minutes and don't be tempted to open the oven for the first 15. The cake is ready when a skewer comes away clean from the middle. Cool on a wire rack. Meanwhile, whisk together the buttercream ingredients to make a thick topping. Like I said, I kept half natural colour for the filling and dyed the rest green for the top. Cue my new stainless steel piping nozzle kit, from which I used the large star shape to create a grass effect. Other shapes in the kit include a small star, petal, plain, leaf and a narrow one for writing. For this technique, I simply put pressure on the nozzle (think squeezing toothpaste from a tube) until it created a star effect and then made a "full stop" motion to finish. I then put the cake safely in the fridge whilst I worked on the sugarpaste decorations. This is the fun part - have a play with different shapes, colours, mixing colours and marble effects. I especially loved the stamps within the cutters which made such a fab effect on the butterfly and leaves - you just press down to create the imprint. Again these were with Sugarflair colours, with a more intense green as well as a mix of pink and blue to create the purple. Just make sure you have lots of cornflour down to prevent sticking! With just plain white sugarpaste, I then cut out the letters. These were a bit more difficult to get out of the cutters but I just used a sharp knife to carefully release. The rest is pretty self explanatory - just be creative and have fun layering up the leaves and petals on your cake. The kit also has some heart and star shapes which would be great for a different theme. Fancy having a go yourself? Here's your chance to win some cake decorating tools and goodies. Simple answer the question below and enter via Rafflecopter. Closing date is April 9th where a winner will be selected at random - good luck! Note: I was sent a selection of Domu cake decorating tools to create my cake, and some to give away for a competition. I've not dabbled in baking for such a long time now, but the idea of playing with fondant really appeals to me! I think pretty flowers are such a simple and easy way to make your cakes look more pristine without taking too much time and effort. Fingers crossed for a spot of good luck. Your cake looks lovely! I'm also not great at decorating but recently have been wanting to get more into it! This cake is so pretty! I've actually never even tried using sugarpaste, but you have made it look very fun here. lemon drizzle. no more needs to be said! Anything with chocolate or coffee in - I love all cakes really! My favourite cake is a chocolate sponge. Mmmm a rich coffee cake with lots of icing! Your cake looks amazing. If that's how it looks when it's not something you do often I can't imagine how great you'll be with practice. My favourite flavour for cakes is something floral like rose or violet. I love a Victoria sponge with homemade strawberry jam. If it's done well, I just love a Victoria Sponge cake. I love Chocolate Fudge Cake but really any cake is good! My favourite cake is a Victoria sponge... boring but when made well they're delicious! I love the look of this cake, I wish I was more confident with my sugar work. I had a bit of a piping masterclass with Luis from GBBO this week so I just need to invest in a roll of piping bags and get practicing! Fruit cake is my favourite, but there isn't many cakes I don't like. Banana cake with chocolate cream icing. any with chocolate in it!! Cheesecake by far, it's so tasty! You're Creme Egg Bakewell Tart is a must-try - my kids will LOVE IT! Any kind of cheesecake, but in particular our families black forest cheesecake. But any type of cake really. I love cake! My favourite is ferrero rocher cake - yummy rich and nutty! My favourite cake is chocolate fudge! Devil's food cake... I love chocolate! Chocolate cake - every time!! Chocolate fudge cake, although honestly I'm not fussy when it comes to cake. I'll eat it all. I love making and eating Christmas cake, but as I'm the only one at home who likes sultanas and raisins, let alone brandy, I now make one each for my Mum and my sister. I'm always trying a new chocolate cake recipe so it's hard to pin down a fave, but my carrot cake and lemon drizzle are tried and tested and I like both myself. Victoria sandwich with lots of jam and cream. Coffee and walnut is my favourite cake. I love Meringue so any cake that contains it is a favorite of mine. I love baking cinnamon buns as they always go down so well. Cake-wise, as easy as it is, I love baking a Victoria Sandwich (or Vicki Sarnie, as I call it) as it's just tasty. (P.S. I wanted to follow you on Pinterest too but I couldn't find a link). I love lemon drizzle cake or coffee and walnut - to be honest, I like most cake, although not a great fan of chocolate cake! Your peanut butter cookie brownies sound delicious - but could you adapt it so that you could use the peanut butter part on its own to make peanut butter cookies? Homemade Carrot Cake is my favourite cake with mascarpone topping.